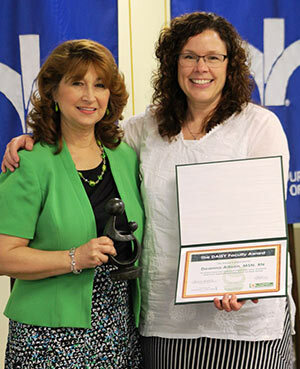 Congratulations to DAISY Faculty Award winner Deanna Allison, MSN, RN. Congratulations to our newest DAISY, Deanna Allison, MSN, RN (pictured above with Dean Sorbello presenting the Healer's Touch sculpture). An excerpt from her nomination explains why she was selected as our 2017 DAISY Faculty Award winner! Additionally, Deanna served as the Student Government Organization (SGO) Faculty Advisor and is actively shaping our student leaders. Last year, she collaborated with faculty to support our students in establishing a National Student Nurses Association chapter here at the College. They hope to see this chapter to fruition during the next academic year. It’s this commitment to teaching, practice, service and scholarship that serves our students, enriches our community and propels our college to world-class status.